It's a crisp spring day in New York and a green Wingstop food truck is parked in front of Extra Butter, a boutique sneaker store in Manhattan's Lower East Side. There's a green carpet rolled out in front of the door of the shop, along with a security guard and a woman holding a clipboard. Outside, the city bustles with activity. Inside, rapper Rick Ross is getting ready to celebrate Wingstop. The Miami rap kingpin has a long history with the Texas-based chain restaurant. Besides rapping about the company on song's like "MC Hammer," "The Devil Is a Lie," and "Thug Cry," he's also the proud owner of over 25 franchises, opening his first shop in Memphis back in 2011. In a brand-obsessed world where Outkast's Big Boi puts his name on a dog shampoo and West Coast legend Warren G hawks male-enhancement pills, Ross' arrangement with the company is a lucrative one, making him an effective avatar of what major-label rap stardom looks like in 2016. But this celebration comes at a strange moment in his career. As a pear-loving meme, he's never been hotter, releasing his own emojis, threatening Donald Trump in his rhymes, and making important cameo appearances in the prestige TV drama that is DJ Khaled's Snapchat. But, as an artist, following the declining sales of his last three albums -- 2014's Mastermind and Hood Billionaire and 2015's Black Market -- and his recent departure from longtime label Def Jam for Epic, it feels like the boss has lost some of the lemon-pepper zest that made him one of hip-hop's biggest stars of the last decade. I arrive at the event before the Teflon Don has emerged from a makeshift green room to greet the press. Extra Butter's showroom resembles the interior of a spaceship and what I assume A$AP Rocky's closet looks like. I'm handed a glass of rosé when I enter and an attentive waitstaff offers baskets of chicken wings. I try the lemon-pepper wings -- they're tasty and worth fiending for. A DJ spins a set peppered with Rozay, Drake, and Prince. Guests mingle and tap away at their phones. Expensive-looking sneakers loom on the walls around us. We wait. Because this is an event to celebrate the launch of the company's online Wingshop, there's a swag section set up. One shirt says "Wingstop is life" and another has little gold drumsticks on it. There are fitted hats, Wingstop socks, and wing-shaped air fresheners that carry that signature lemon-pepper aroma. It's strange in the way all marketing that attempts to co-opt something "cool" is strange. Then I see it: a gold chain necklace with a golden drumstick on the end. The drumstick looks like a smelted baby arm balled up in a fist -- or a decent-sized gold turd. Given the loaded racial history of fried chicken, it is, putting it lightly, problematic. I see a guy trying one on, marveling to his friend at the absurdity of the thing. Moments later, Rozay bursts into the party, looking trim in a blue shirt and white jeans. His beard looks immaculate and he's wearing his signature sunglasses. After a quick introduction from Wingstop CMO Flynn Dekker, Ross glides through the room in the way that only celebrities and really confident cats can. He dances to his own hits, takes selfies, and gives out hugs. I approach Ross and yell a question about Wingstop to him over the music. "For me, it's about being a trendsetter," says Ross in his commanding baritone. "It's so important to me. Me being part of a franchise in this type of role is really new and different. It's become such a cool thing and I'm happy we did it." Favorite type of wing? I ask. "Of course it's the lemon-pepper wing," he says. "All flats. I'm team all flats. It's all flats vs. the drum squad." These phrases should be familiar to anyone who follows his very pro-Wingstop Twitter feed. I don't have the heart to tell him that I'm a member of the drum squad, so I change the subject and ask if he watches Game of Thrones. "Not much," he says. I have an obnoxious follow-up question ready in my head about the beards on Game of Thrones, but I don't want to force it. 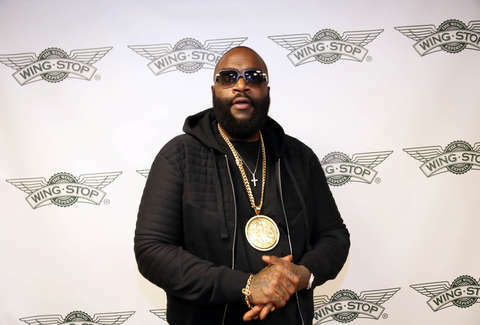 Rick Ross is here to promote chicken and spread the Gospel of Wingstop. He's enjoying himself. His sister is in the crowd. He's in his element, surrounded by food, family, and all the pleasures of a celebrity-brand relationship. Later, I circle back to the merch area, get a swag bag, along with my very own gold-chain chicken necklace, and head out into the night, the aroma of lemon pepper still in the air. Dan Jackson is a staff writer at Thrillist Entertainment and a fan of all of Rick Ross' ad-libs. He's on Twitter: @danielvjackson.